Electrical circuits are used throughout aerospace engineering, from flight control systems, to cockpit instrumentation, to engine control systems, to wind tunnel instrumentation and operation. The most basic circuit involves a single resistor and a source of electric potential or voltage. Electrons flow through the circuit producing a current of electricity. The resistance, voltage, and current are related to one another by Ohm's law. There is usually more than one resistor used in a practical circuit. When analyzing a complex circuit, we can often group components together and develop an equivalent circuit. In the analysis of circuits with multiple resistors, we must determine if the resistors are subject to the some voltage or to the same current. Multiple resistors in a parallel circuit are subjected to the same voltage. Multiple resistors in a series circuit are subjected to the same current. On this page we discuss the equivalent circuit for resistors in series. If we consider each resistor separtely, each resistor has its own current (i1, i2, and i3), resistance (R1, R2, and R3), and voltage (V1, V2, and V3). The resistors are connected to each other at nodes. The nodes are denoted by small circles on the figure. For this circuit, there are four nodes connecting the three resistors and the power source. At each node, the current coming into the node must equal the current leaving the node according to Faraday's Law. For this arrangement of resistors, there is only one wire coming into and leaving each node. 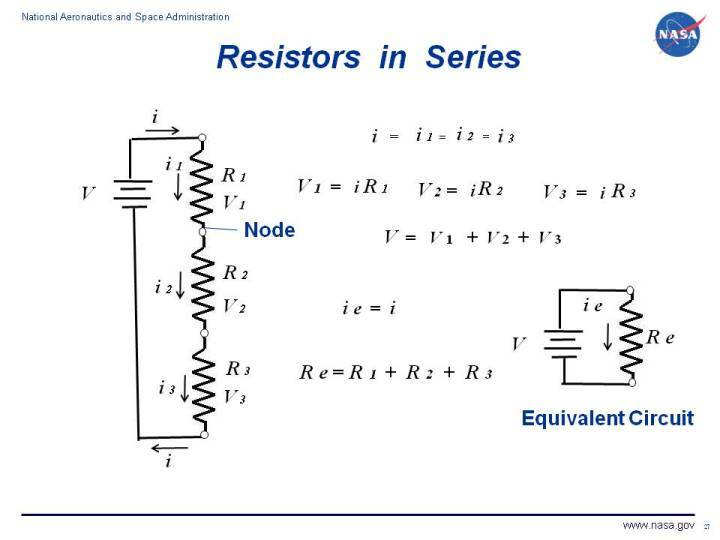 Therefore, the current through each resistor must be the same. We can use this knowledge of the series resistor circuit to analyze the Wheatstone bridge circuit that is used for temperature control for wind tunnel force balances using electronic strain gages.